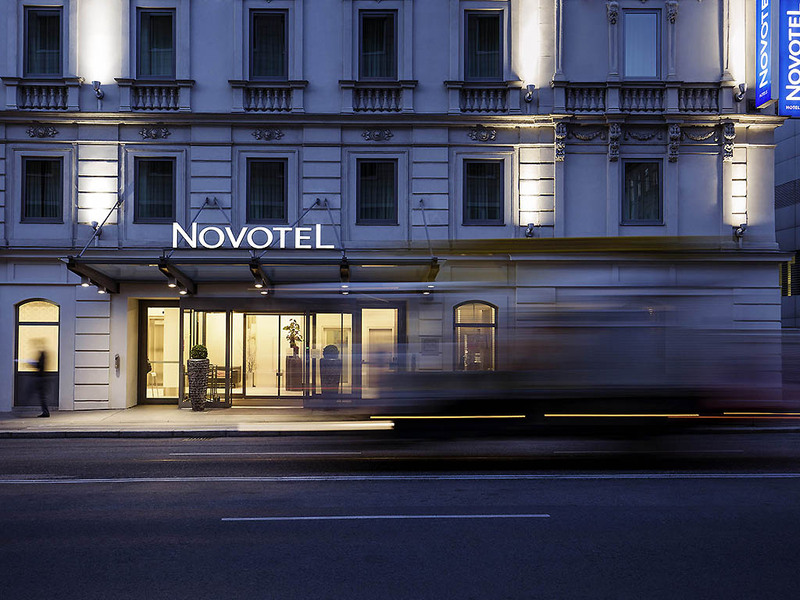 Behind the historical façade of the Novotel Wien City hotel is a modern 4-star hotel offering bright, comfortable rooms. Two children under the age of 16 can stay in family rooms free of charge. Surf online for free, explore the old town of Vienna or walk to Prater park or to St. Stephen's Cathedral, both of which are within easy reach. Then take some time out and relax in our fitness room and sauna or round off your evening with a drink at the bar in the "Family and Friends" restaurant. A place to eat, a cafe, a place to meet, relax, enjoy and while away the time. An ideal opportunity to perk yourself up with a cup of coffee, recharge with a selection of tasty meals or wrap up the night with a nightcap. Having read the previous reviews after having already booked the Novotel City Wien, I got a bit nervous. Well, time to clear it up. Novotel is an excellent hotel. I stayed for four nights in a recently renovated room. Very clean, comfortable and spacious (room 616). No queue at breakfast in any of the four days (Thu - Sun). The food variety is really good (maybe some improvement in the hot food area is needed). Personnel was friendly and helpful. The underground parking is pretty easy to access, as there are signposts outside and a location map is made available at the hotel's reception. I feel the recent critics (dated Dec 2018 and Jan 2019) are not applicable anymore. I was there for two nights and I have to say that all in all the place is nice. The position is great, very close to the city center and the train station that connects with the airport. The room was clean and a lot of different choices were offered at breakfast. BUT there were a few things that left me a bit puzzled: I was requested a deposit at the check-in (although I had already paid the full amount in advance), and after providing two credit cards (Maestro, Visa), it turned out that I could only pay via Mastercard. This was of course not mentioned in advanced, and really bothered me to see that they wouldn't try to find a solution. Also, the room was much smaller than expected. The hotel was typical of mid range standards. The room was spacious and in good condition. However when we arrived there was no-one at reception for 5-10 minutes. This was important as the hotel parking arrangements are not nearby and you will be unlikely to find them without guidance. Even with directions, the parking garage pedestrian exits are confusing. On return we were given a parking chip that was supposed to open the doors to get to our car, but it did not work. There are several locked gates you need to get through and they are not well signposted. Reception was not very helpful when we had to return to the hotel to get access to the garage. Overall very poor attitude and customer service. Would not recommend this hotel if you bring your own car. Stayed here to visit the Breugel exhibition, visit the Xmas markets (the one by the Rathaus, with ice skating, is amazing) and the Opera House. Hotel is well placed being near to U1 and ring trams and s clean and comfortable. As many times before, this was also very pleasant stay in Novotel Vienna City Center. We noticed new style of the restaurant and also very nice decoration for Christmas. Rooms are very clean as always, although we did not insist on upgrade this time because we stayed only for one day. The staff is also very pleasant as always during our previous visits. all just fine! Room, staff, procedures. Everythig was ok. Near to the center. Helpful and friendly staff. Good and varied breakfast, clean rooms. Maybe only one small thing. For suitcases there is no enough place. But absolutelly I recommend this hotel. The rooms were very outdated. Not normal for the other novotels that I have stayed at. Furthermore, we had a waiting time of more than 15 minutes to be allowed at the breakfast tables and they could not follow with bringing in food. Room given to me was quite compact though clean . Noise factor was a bit bothersome from adjacent rooms reducing sleep quality . Air con was ordinary and room felt a bit stuffy .Breakfast quite average though not worth price tag . Plus point was good central location and quite close to metro station on U1 line . Quick and nice check in and room change. Nice staff in the bar/desk. Room OK.
Nice hotel, quiet rooms within the hotel. Excellent window sound proofing.Expensive for what it is.Busy hotel, had to wait for seating at breakfast times.ideally situated for the city centre and the river. Everything within walking distance. Great location, buffet breakfast, evening meal, room, shower. Staff all fantastic. Couldn't do enough for us on our stay. Really pleased we chose this hotel which is only 10/15 mins walk to city centre. Can't vouch for parking as used local transport throughout (which by the was excellent and cheap). Would highly recommend this hotel. This hotel is situated in a good position, very close to U1 subway and also at no more than 10 minutes walking from the city centre. The personnel is friendly and helpful. The room was not the best, with a window opening on an internal yard; however it was quite clean and well kept. We had no particular problem for the breakfast, no queue, like many customer reported; as a matter of fact, the restaurant is small and maybe in busier periods you could have to wait. Very good service, all the people speak english so you will not have any problem as a foreign traveler. The location is good, the only problem was the parking, is not in the same building, you have to walk 2 blocks. We stayed at the Novotel Wien City. We were received by exceptional welcoming staff. Special thanks to Maria and Kati. Both are amazing and very helpful all staff at the restaurant are very professional and have a beautiful welcoming smile. They are ready to help you and do the beat they can to make your meal enjoyable. The hotel is very clean and rooms are very spacious and very modern. Beds are comfortable. My daughter loved the small kids play area. This is by far one of the best hotels and exceptionally outstanding staff. Thank you all staff members for making our stay a memorable one. Nice room and clean. We didn't experience the feeling of being expected at arrival- the reception staff was not not updated and didn't make feel welcomed. Information about car parking in advance would have been nice. We went to the restaurant twice, on the evening at arrival there was confusion about the dining offer we made at booking, one waiter was alone in the restaurant and very busy. You need to have more staff at the restaurant. Food ok. The breakfast was good. Stay was great again. The online checkin was pretty useless because My cardcard had to be typed in again.